Cambridge College alumni share pride in an extraordinary tradition of opportunity, community, social justice, and leadership. The Cambridge College Alumni Office is dedicated to keeping the alumni of the School of Undergraduate Studies, the School of Management, the School of Psychology & Counseling, and the School of Education in touch with each other and engaged with the College. 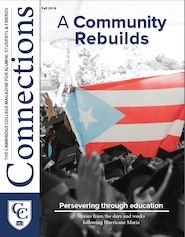 Click on the cover image to read the latest edition of Connections, the Cambridge College magazine for alumni, students and friends. Alumni course tuition discount - 25% off courses. Applies to individual courses only, not to degree programs, certificate programs, or courses offered in collaboration with other institutions; good financial standing with the College required; undergraduate courses limited to six credits. Boston Young Professionals Association (BYPA) network group - 25% off annual membership. Discount code (CAMBRIDGE). Go to http://bostonypa.com to view upcoming events. Springfield Young Professionals Association (SYPA) network group - 50% off annual membership for current Cambridge College students and only $60 annual membership for alumni. In addition, free entry to town and city Chamber of Commerce events. Go to https://springfieldyps.com to view upcoming events. Liberty Mutual Insurance - Discounted rates on home and auto insurance. Call 800-699-4283 or visit Liberty Mutual to get a free quote (the College receives a donation from Liberty Mutual when you sign up with them). My Hotel Rewards - 10% off booking at over 400,000 hotels and resorts worldwide. Go to http://myhotelrewards.net/cambridgec/ to learn more. Cambridge College Custom Diploma Frames - 20% discount on diploma frames and support the College. These frames can be purchased at Commencement or by contacting Bridget Kent, Advancement Services Manager, at Bridget.Kent@cambridgecollege.edu. Cambridge College CC Shop - 10% off Cambridge College merchandise. Please present Alumni Association Membership card for discount (in store only at this time). Cambridge College Career Center - Offers free professional development, career advising, and job search support to all alumni. Go to http://www.cambridgecollege.edu/offices/student-affairs to learn more. Use of Cambridge College event space - Use of our new premium Boston location event space for your next function. Please contact Erik Ryan, Director of the Annual Fund and Alumni Engagement, at erik.ryan@cambridgecollege.edu for more details. Special invitation to alumni only networking and career events - Look out for alumni-only events on the Alumni Events page at http://www.cambridgecollege.edu/alumni-friends/alumni-events. Please make sure you present your Cambridge College Alumni Membership Card to get these great deals and discounts.